Nothing is quite as romantic as a passionate embrace on the beach. 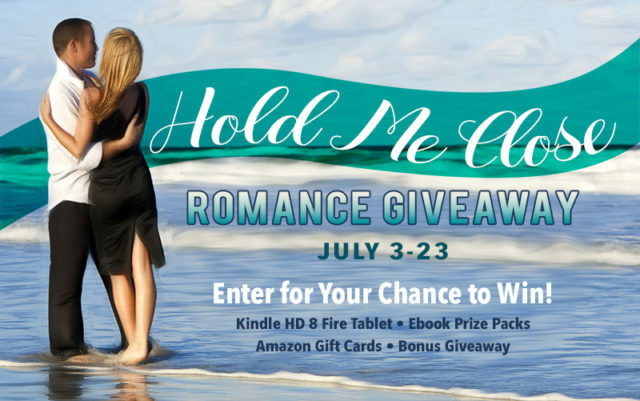 Enter our giveaway and you could win a Kindle HD 8 Fire tablet just waiting for you to load it with romantic beach novels. Or maybe you’ll get lucky and take home one of three ebook prizes packs where you get to choose the ebooks on Amazon you’d like us to buy for you! Plus, you’ll find the latest book bargains from our sponsoring authors when you shop our book fair, all priced at 2.99 or less, with some FREE exclusive downloads. (Including Better than Gold from me!) Don’t forget to play our Scavenger Hunt Bonus Giveaway! Take me to the Book Fair!